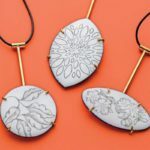 Once you’ve mastered the basic metalsmithing skills required for ring making, you’ll probably want to start jazzing things up a bit with textures and other designs. 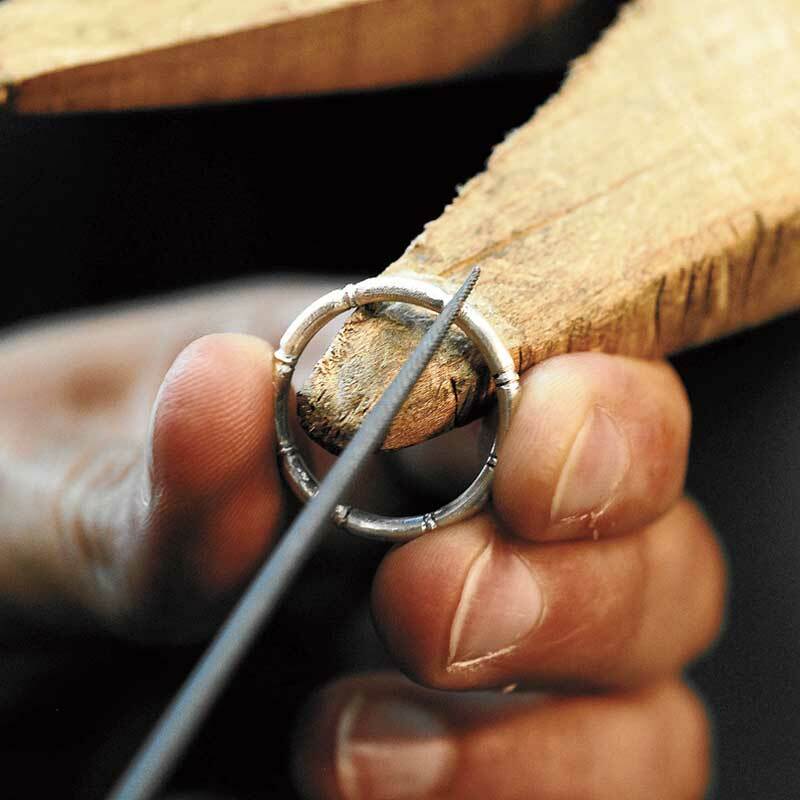 As a follow-up to my Metalsmithing Basics: Learn to Make One-of-a-Kind Rings in an Hour post, here’s a way to turn those plain bands into stylish bamboo-style rings with just a few basic metalsmithing tools and well-placed design elements. 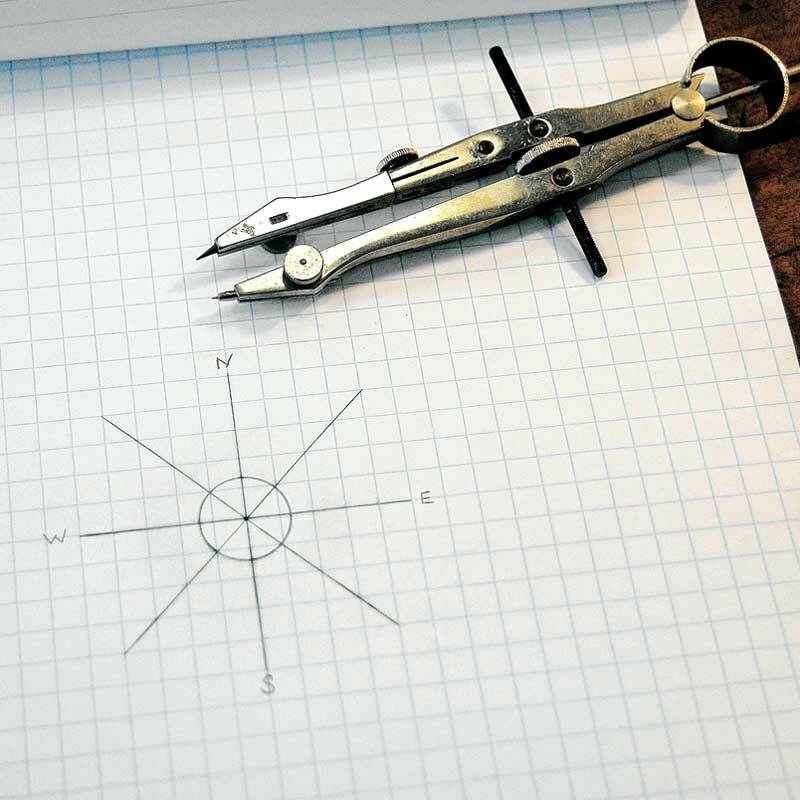 This classic, elegant design builds on simple metalsmithing techniques–forming, soldering, filing–but demands a degree of proficiency and attention that can challenge the beginner or advanced beginner. 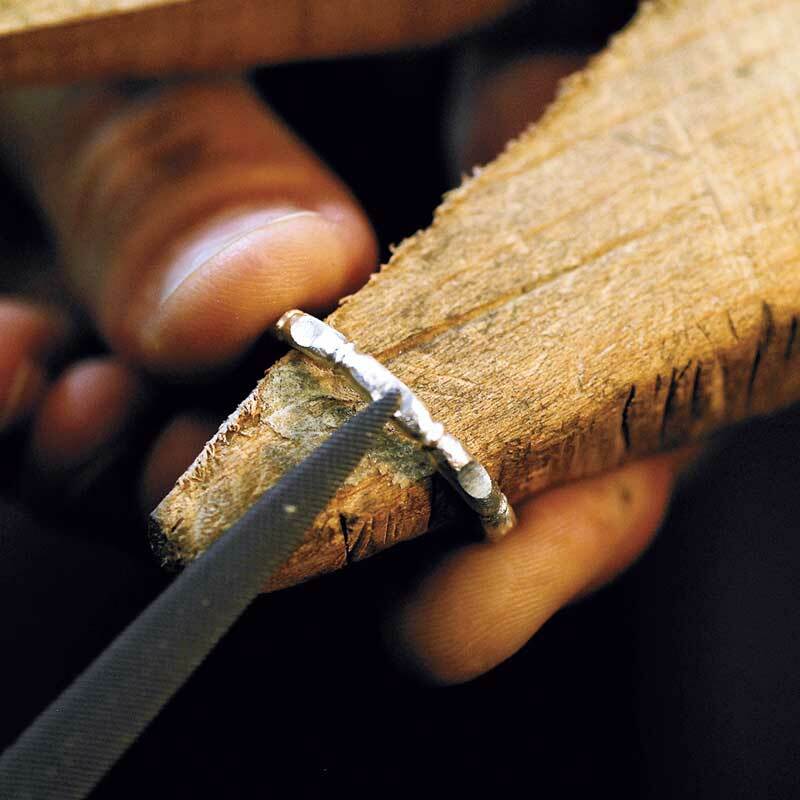 After the band is formed and soldered, the bamboo texture is slowly revealed through scoring and filing. 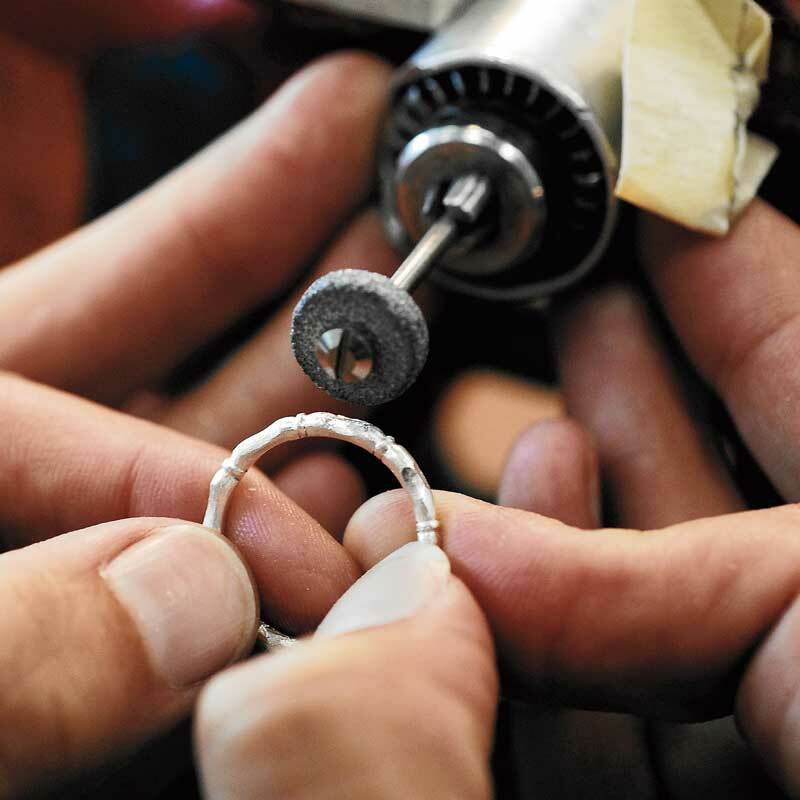 With one ring made, you can create more in other metals, make several to hone your ring making skills, or have the original cast in multiples: this design works well for stack rings. Once mastered, the bamboo effect may also be used for bracelets, earrings, flatware handles, or handbag hardware. After you’ve formed the basic band, follow these steps to create the bamboo look. 1. 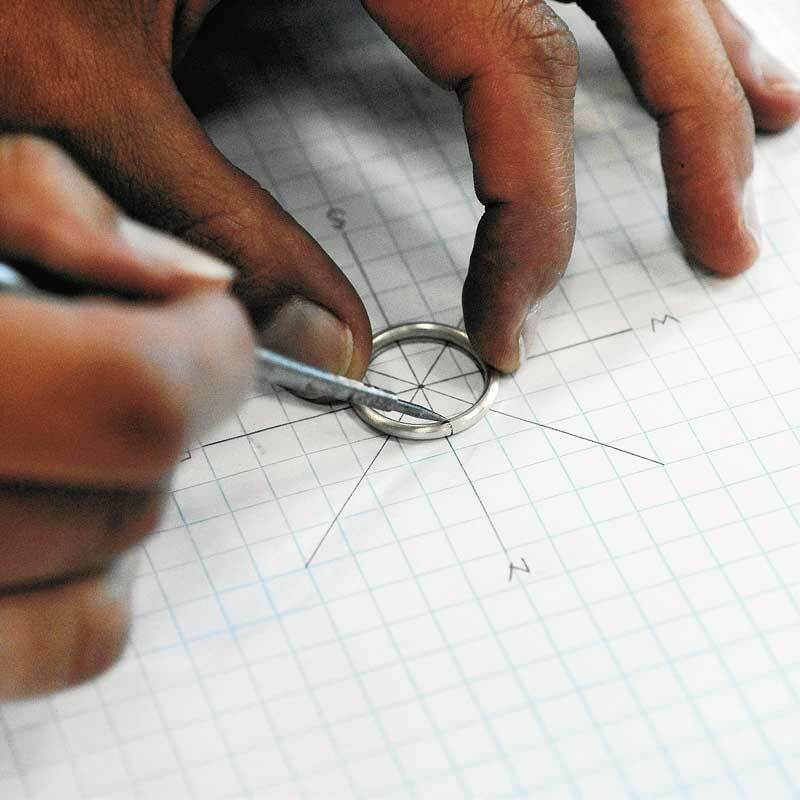 With a compass, draw a circle on graph paper slightly smaller than the inside diameter of your ring. Divide the circle into eight equal parts. Label the circle North, South, East, and West, then North East, South East, etc. 2. Lay your ring on top of the drawn circle. At the North point, scribe a vertical line on the ring. 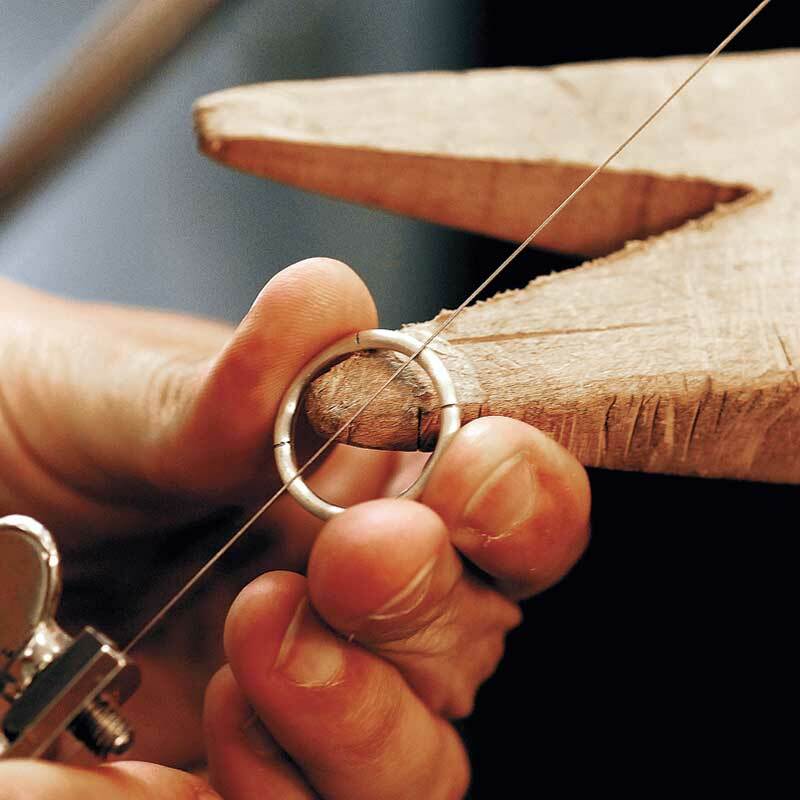 Score that line completely around the ring stock using a 2/0 saw blade. Turn the ring a quarter turn so the previously scored line is facing East. Scribe and score again at the North point. Turn another quarter and scribe/score again on the North point. Repeat to divide ring into four equal parts. Important: Always work off the North point when positioning the score lines on the ring shank. 3. Position the ring back on the paper template. Scribe a line between North and East. Score that line around the shank using a 2/0 saw blade. Using North East as the new scribing/scoring point, turn the ring to face South East and repeat. Repeat until the ring is divided into eight equal parts. 4. One millimeter to the right of each scored line, scribe a second line. Score all around the shank using the 2/0 saw blade. Note: The second line should not be exactly parallel to its neighbor–it should taper toward the center point of the ring. 5. Use the triangle file to cut V-shaped grooves in every scored line. Use the crossing file to round the sides of the V grooves. Note: The higher side of your crossing file should face out toward each of the segments. 6. Use the high side of the crossing file to create the curved bamboo shape. Starting in the center of each segment, file a shallow U-shape in it. Do this in all eight sections. 7. 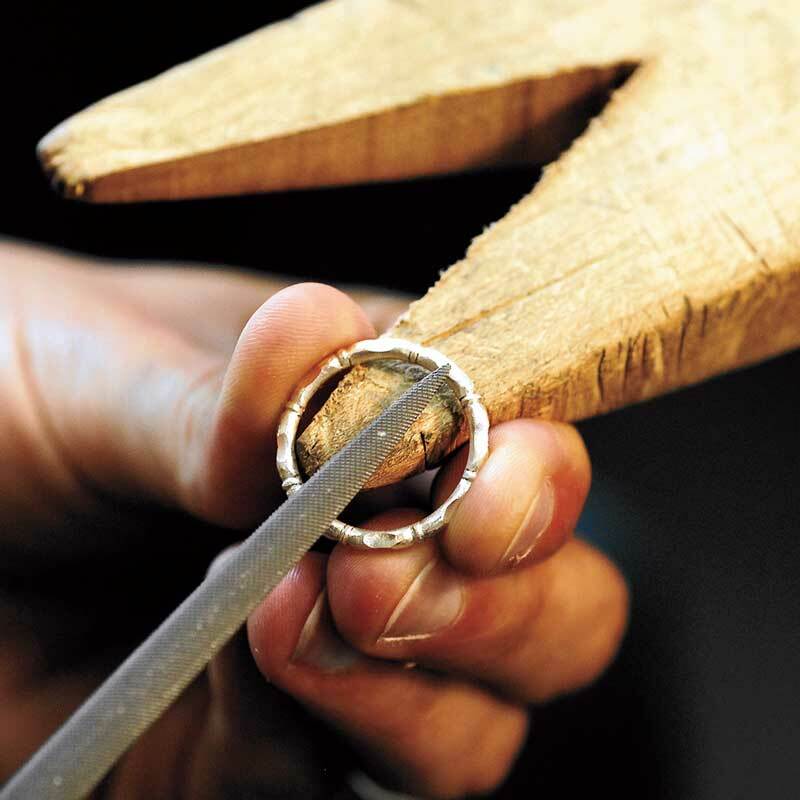 Repeat this process on both sides of the ring to taper each segment all around the shank. 8. Fasten the flex shaft hand piece into the vise. Insert a small Mizzy wheel into the chuck and rough out the remainder of the bamboo shape. Smooth the marks from the Mizzy wheel with the coarse/medium silicone wheel. Then, smooth the marks with the medium/fine silicone wheel. 9. 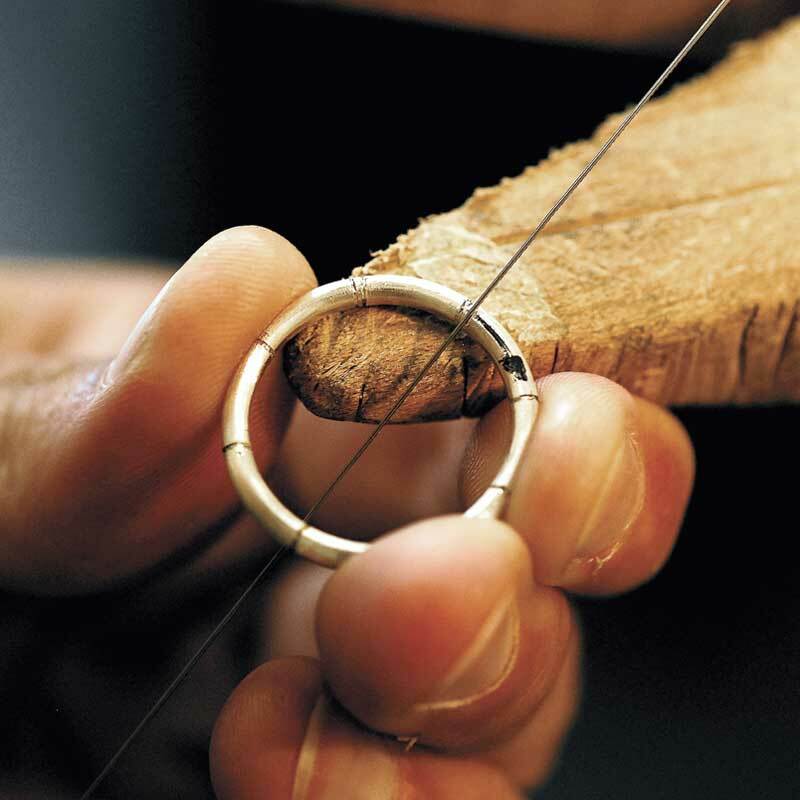 Finish the ring with the muslin wheel loaded with rouge. Design options: This design makes a great stack ring. 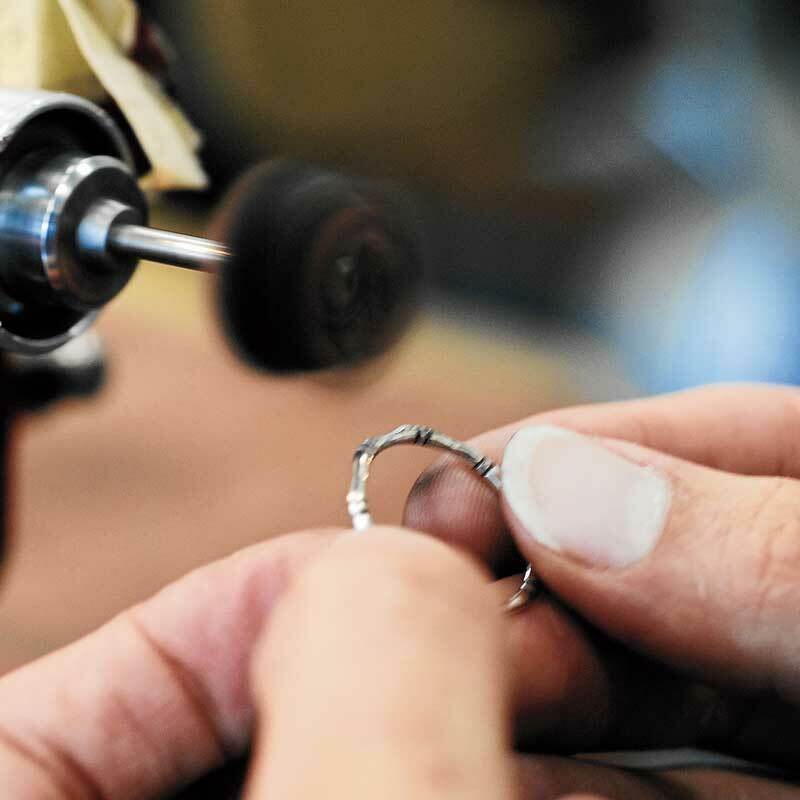 Try several in different metals and finishes to practice your ring making skills and perfect your technique. Want more quick, easy, and stylish ring projects? 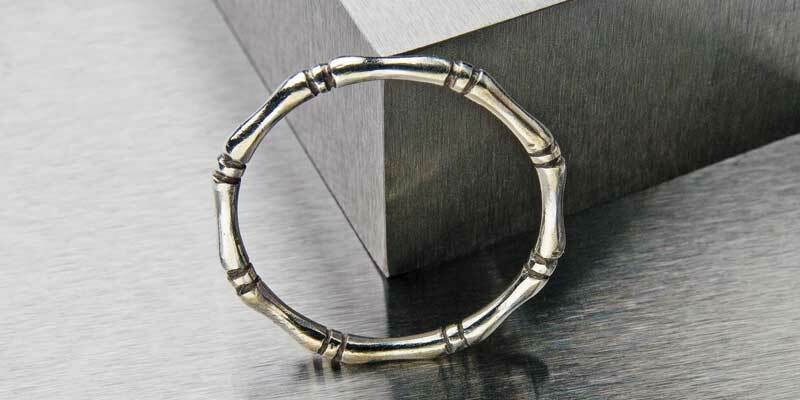 Check out One-Hour Rings with Helen Driggs for seven one-hour tutorials. ELIZABETH ANN TOKOLY is an instructor at the 92nd St. Y in New York City, and holds an MFA from Cranbrook Academy of Art. 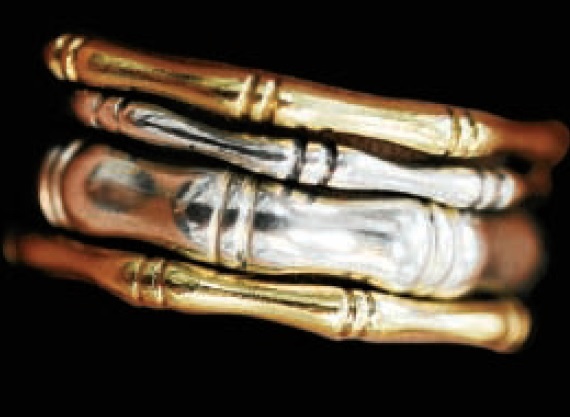 She has worked for prominent jewelry designers and artists, including Steven Logos and Jan Yager. She is the founder of Studio No. 159, The Fine Art of Design, in Jersey City, New Jersey. Let the Flex Shaft Open Doors for You!